Every now and then a player in the NHL that went undrafted can explode onto the scene and have all other clubs asking why they passed on him. When the Calgary Flames signed Ryan Wilson to a three-year entry-level deal in 2008 they were hoping this is exactly what would happen. 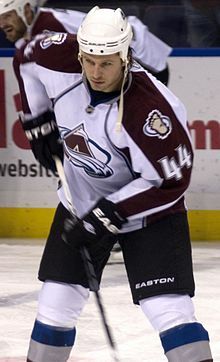 Wilson only played for the Flame’s AHL affiliate, the Quad City Flames, before being traded to the Colorado Avalanche in exchange for veteran defenceman Jordan Leopold at the 2009 trade deadline. The Avalanche had traded away an injury prone defenceman for a player that appeared to be on the rise. Unfortunately, the injuries would continue to roll in. Unofficially Wilson stands at 6′ 1″ and weighs 207 pounds. While his skating is fair, Wilson would certainly be qualified as a stay-at-home defender. Due to his big size, big hits where a part of his game. This combined with other factors lead to Wilson being injured constantly. Wilson played parts of six season with the Avalanche. The glaring downside to these six years is the number of games played. The most games Wilson has played in one season was 67. That would mean he came up 15 games short of a full season in 2010-2011 and that is the closest Wilson would get to playing a full 82 game regular season. In other seasons Wilson seasons consisted of 28 games in 2013-2014, 12 games in 2012-2013, and most recently in 2014-2015 Wilson played in only three games. With a blue line that has been questioned by Avalanche faithful and NHL insiders for years, it is hard not to wonder what would be different if Wilson could ever stay healthy. Wilson is at an age where he should be in the prime of his career. At 28 years old Wilson would highly sought after given his size and hitting ability. However, only having played 230 NHL games since 2009 sets off a huge red flag to any team looking to add to its defensive core this off-season. Wilson is a UFA this off-season and appears to be one of several players that have played their last game as a member of the Avalanche. If Wilson can stay healthy, and that is a big if, there are some upsides to his games. No, point production is not one of them but he could become a relied upon shut-down defenceman. Wilson has shown a great ability to skate backwards, line up a forward, and step into a big hit that separates the man from the puck. His big body allows him to play this way and some of his hits are devastating to the players on the receiving end. This can be one contribution to the injury issues. Yes, Wilson is initiating the hit but his body feels it just like the other guy does. Wilson only being 28 years old would suggest that he has a lot of game left to play but everybody knows his history. The Avalanche traded away a veteran defenceman that had injury issues for a younger defenceman that would turn out to have injury problems as well. It really seems like the Avalanche have just been waiting for Wilson’s contract to expire so they can cut their losses and put that cap money somewhere else. It is difficult to say what the career of Wilson will consist of in the future. A team may be willing to take a gamble on him but it is sure to be a small gamble. Wilson’s best case scenario would probably be a one year deal for a team that is looking for a surprise to bolster their blue line. However, a PTO is the most likely option for a team that wants to give Wilson a chance without any kind of commitment to him. Only time will tell what happens next for a guy that, under other circumstances, would be a highly sought after player.